I promised I would give you guys an update on the house so here we go. There has been A LOT going on especially since the last time I gave you a proper updated.We are getting so excited about how it is all coming together. 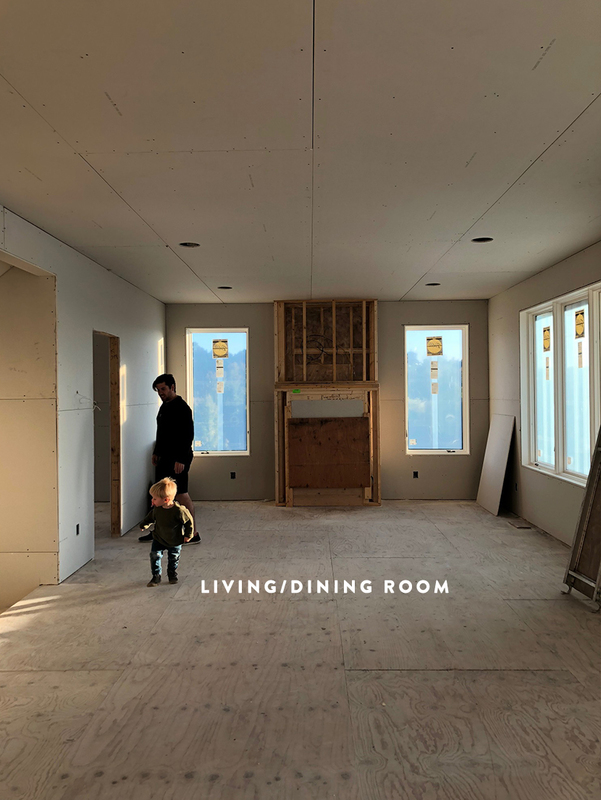 Though we are still trying to figure out details about the living room and a few other spaces in terms of design and decor, we are loving watching the drywall go up and all of our lights and final pieces arrive at our doorstep every week. This process is exciting there is no doubt and there have been times it is nearly a full-time job with all the meetings that you have, but it is all well worth it watching our dreams come to life. So let’s dive in! One big thing we decided to do with some extra budget we had (we nixed the metal roof and it left us PLENTY of room to make this decision). This means that we won’t have to have drywallers come back. All we need to do to finish the space is to lay flooring, trim and paint. Not bad, right?! Everything is properly insulated and we won’t be getting drywall dust in our HVAC at all. A much easier task to tackle. The other thing that was great about this is that in Michigan if you don’t drywall your basement they still have to insulate it by code, but that insulation is different than the insulation they use if you do the drywall. The framing is different and all sorts of other things. This means sometimes it can end up being more to wait to do it than just to do it when it is all in process. 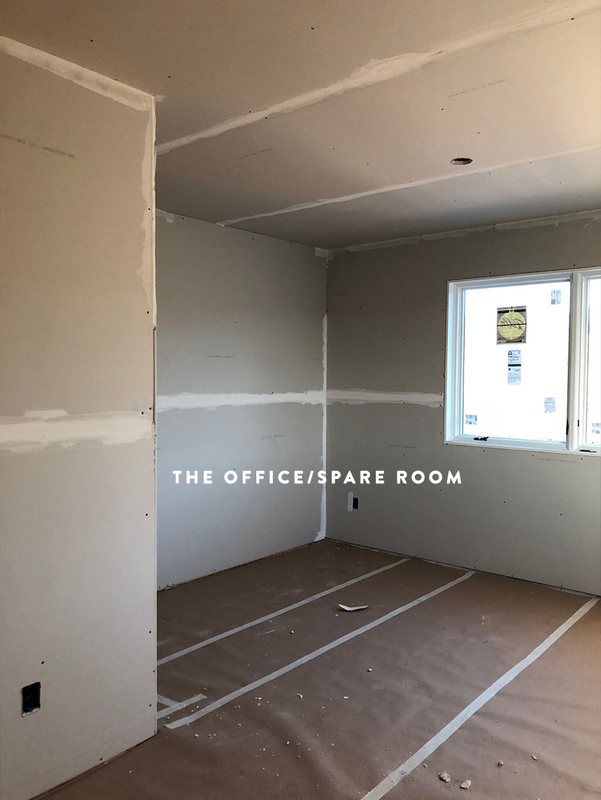 We love having it drywalled too because now this space can still be used for the most part. I will be using it for some projects I have with TFE and so on coming up next year. The rest of the main floor now is currently wired, HVAC’d, plumbed, etc. 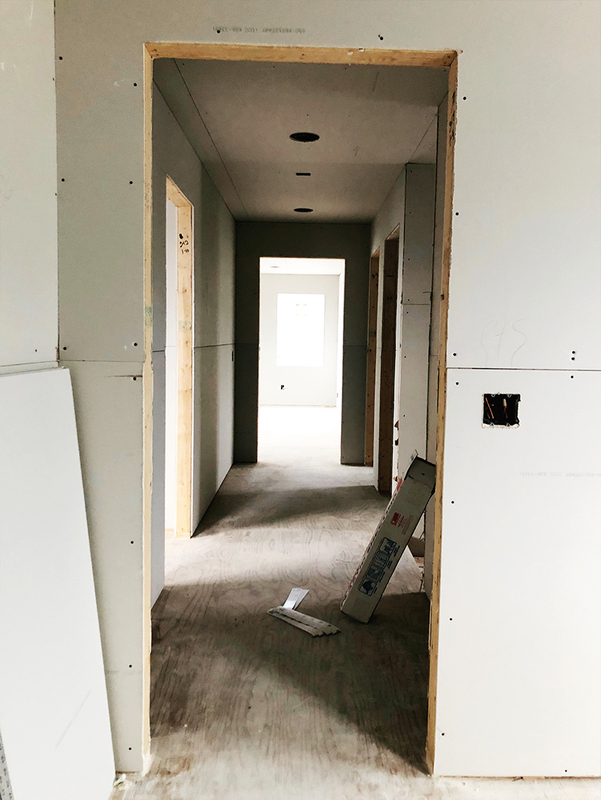 This week they are finishing up the mudding of the drywall and should be ready to lay our hardwoods at the end of the month if all goes smoothly and stays on schedule. 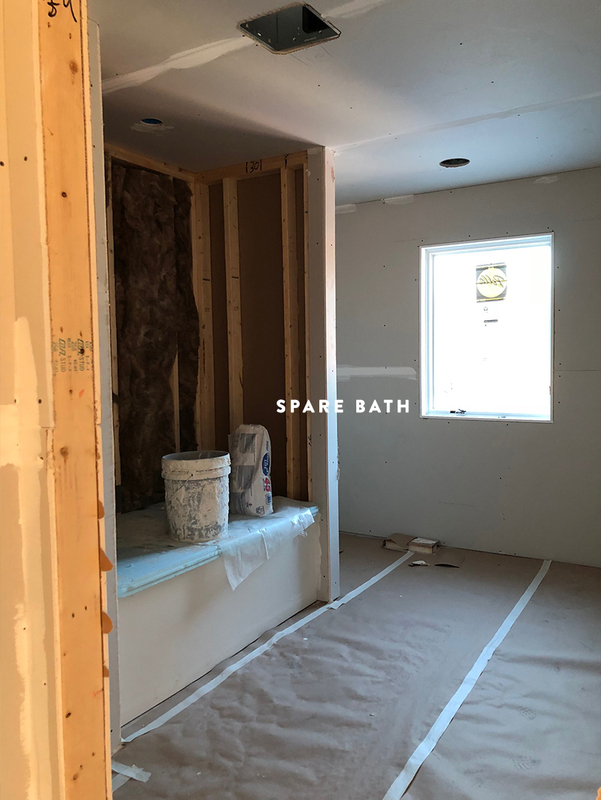 You can see our vision for the Half Bath and Entry if you want a refresher. 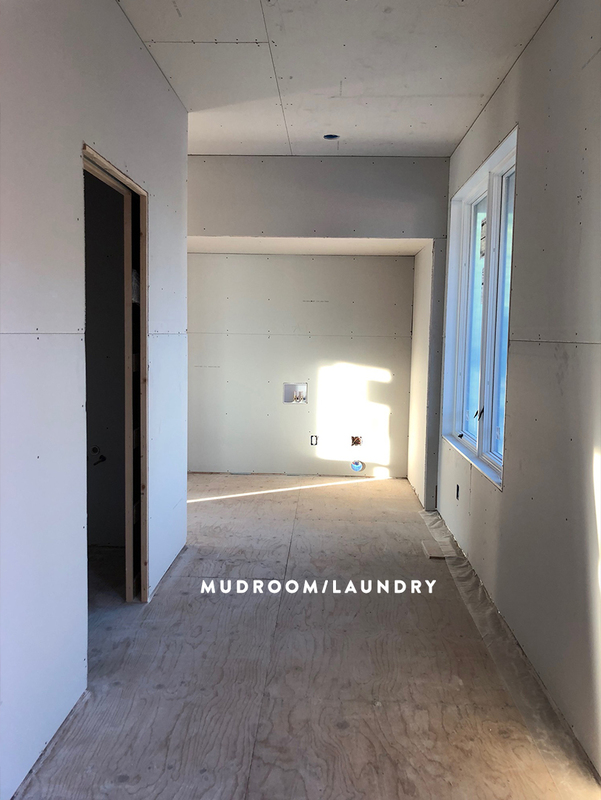 I have a post about the design of our mudroom/laundry coming, but just to let you know at the end of the hall our laundry will be there. We bought Whirlpool Duet Washer and Dryers to go side by side inside of cabinets with a counter over the top. This way we kept them hidden, but still right there on the main floor. Currently, all of the corners are done on the drywall. 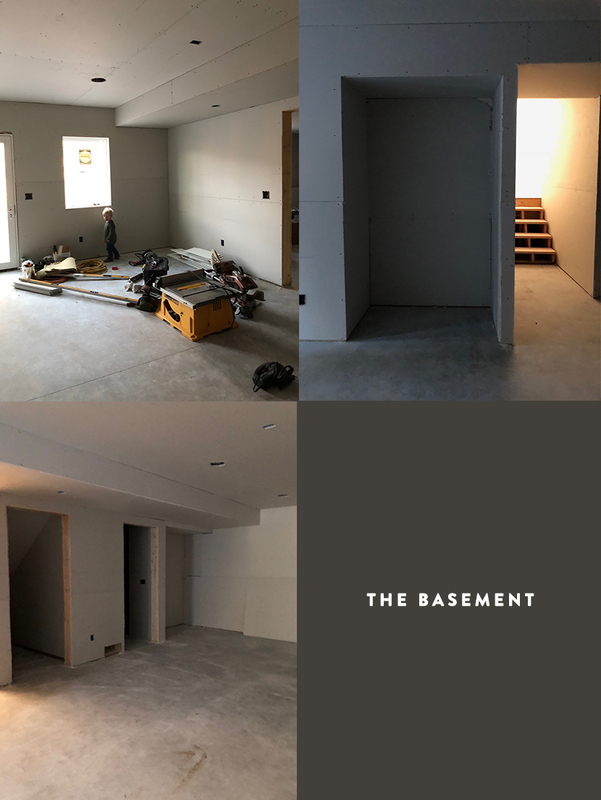 The drywallers have worked from the second floor to the basement on finishing so that they can follow the same pattern with installing flooring and tiling. This is the hope so things can keep moving. We also made the final decision to place hardwoods in the whole house so we have hard surfaces throughout the home. We wanted this but had planned to compromise on a few spaces on the house. It ended up working out we could make it happen, so we will carry the same Natural Maple floors throughout the house. In Kitchen, everything is prepped for the finishing to begin on the space. We have a wall for the cabinets to attach to. We will be doing a waterfall quartz for the counter and the sink in the middle of the island. There will be three stools here as well. More about this space with renderings in the coming weeks. Many of you have asked, but we finally feel confident about decisions to share them all with you! 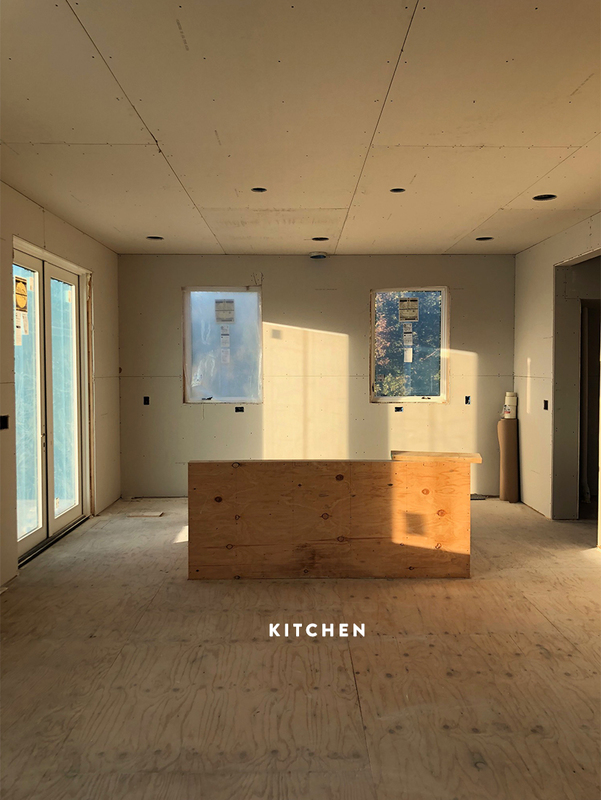 VERY excited about our kitchen. One tip a friend’s parents suggested was to pull the 24 in depth cabinets out to 30 inches so we had 30 inch depth back counters so we have a lot of space for food prep. Great tip! Our living and dining space also feels very real. This space has probably made us lose the most sleep and if there was anything I would say we learned is that we probably could have laid out this area a little better. It is still a great space but not as wide as I think we had hoped. BUT we still love it. It was what worked without layout and other priorities with the space. We just are trying to hunt down the right layout for furniture still…You can read more about our thoughts and ideas about the space here. As we head upstairs and seeing this space have real walls we are SOOOOO happy we widened the halls up here. It is so nice to have so much space up here. We added I think about 10 extra inches and it feels so nice to have that space. Big thanks to Sean at Hygge Supply for that detail. Above is how the kid/spare bath looks. We love that we have a window in here and that we have so much room in this space. I think it will be so nice to have this as our family grows and gets bigger. My favorite space in the house besides the Kitchen is our master. 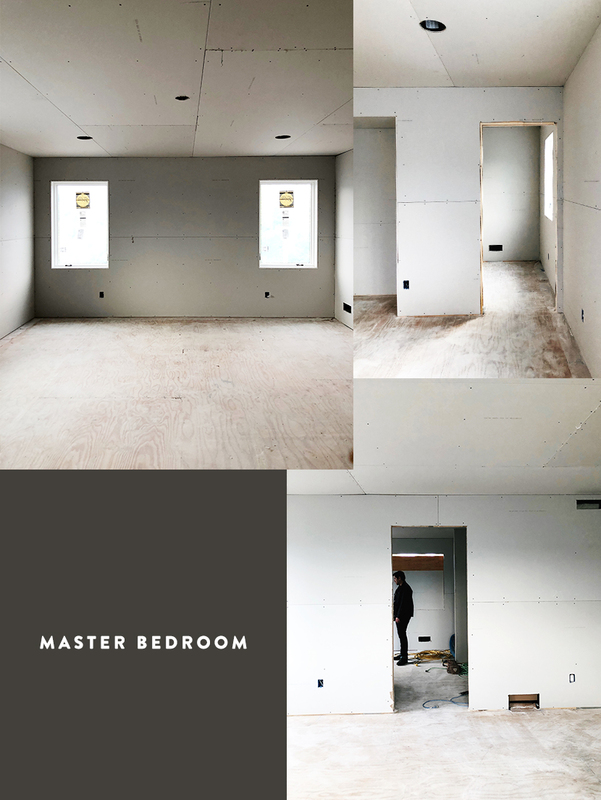 We designed this space probably with more space than we need because we were thinking about resale down the road, but we wanted to make sure we could have a king bed in the space. By our Sean of Hygge Supply’s recommend we will have a cabinet/closet in the room that is flush to the wall so no need for any drawers. We will also have a walk-in closet as well. It will be a very neat space. 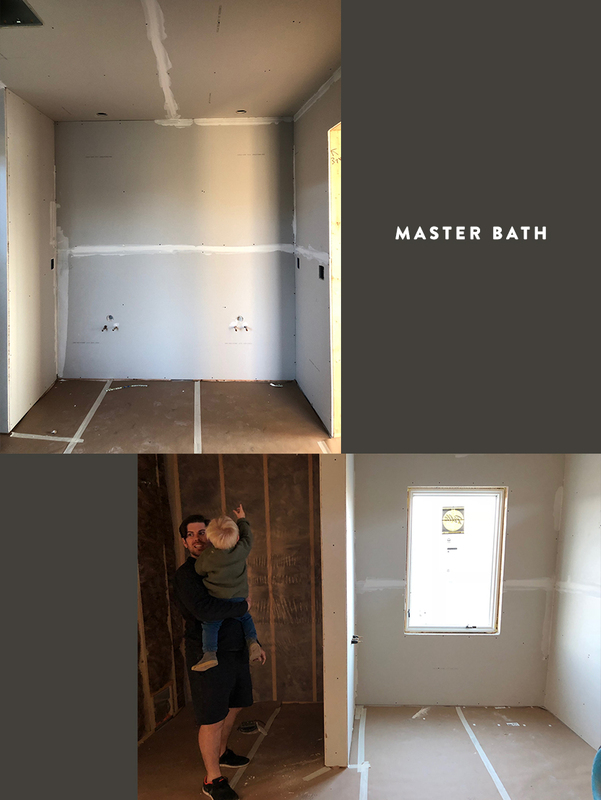 Our master bath is also a total dream to us as well. For a few weeks we were missing a window so it looks darker here than it is now that the window is in, but we are so excited to see this space come together. More about this space in the coming months though. 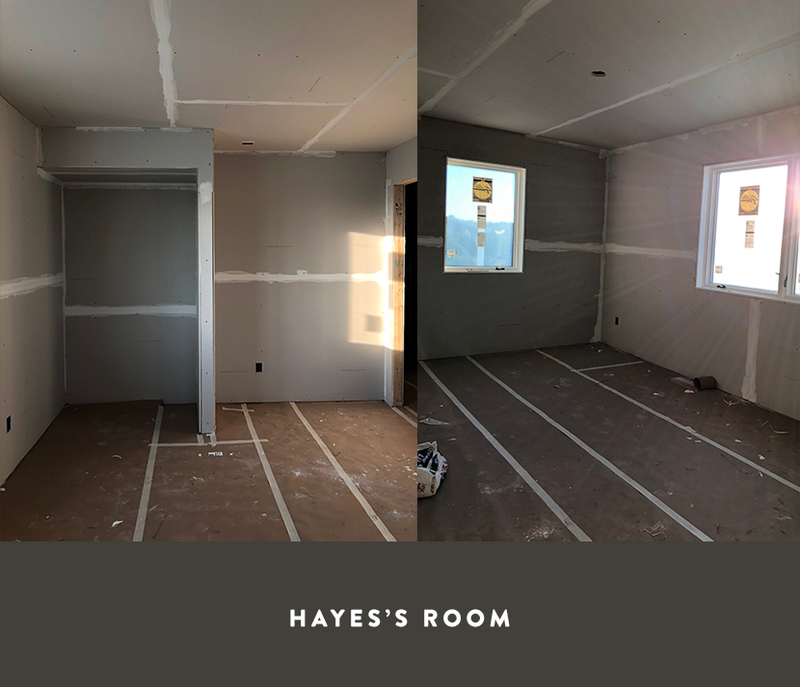 We tossed back and forth about what room to put Hayes in, but ultimately decided the front bedroom would be our office/workspace in the house for now. This is the larger of the two rooms and we have a vision for the type of space we want and this room accomodate that better. 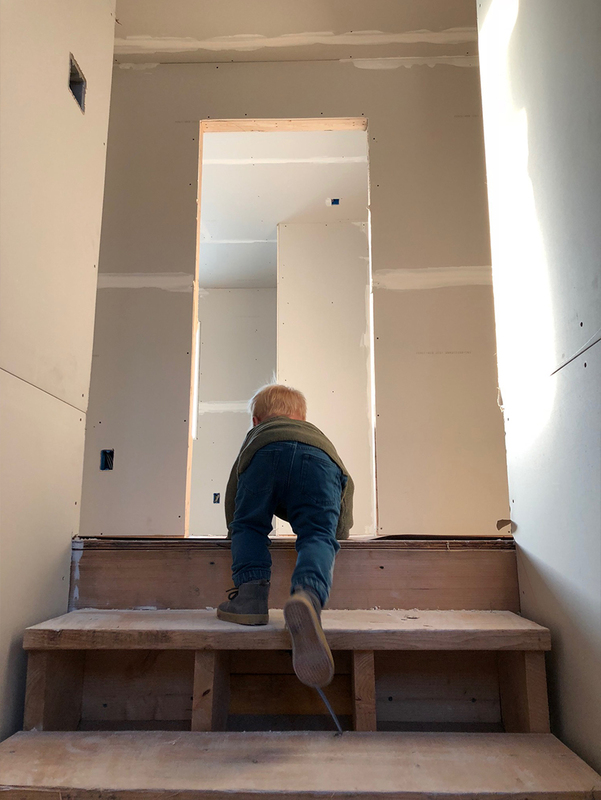 Hayes’s room has the best view in the house. 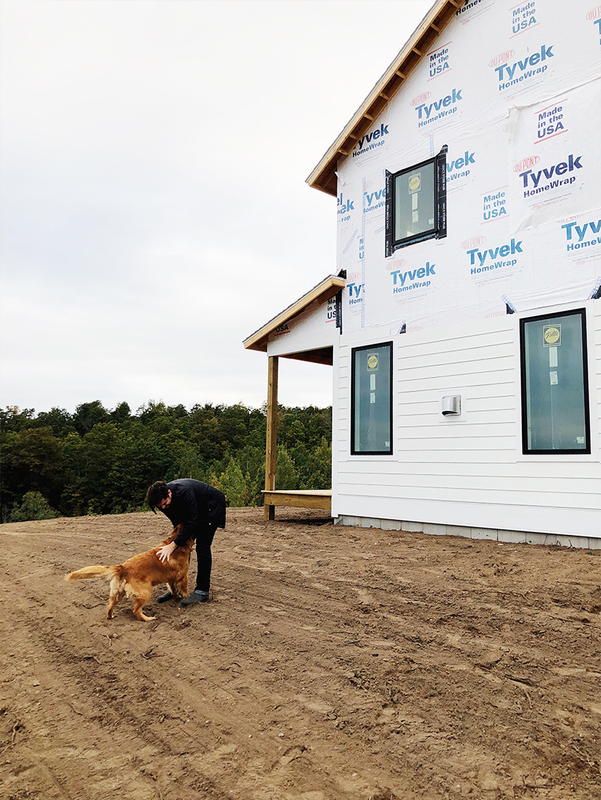 We loved the idea of him waking up with a view of the rolling hills of Leelanau County every day. He would also get the gorgeous sunsets every day as well while growing up. Though it is a slightly smaller room than the other, we love the simplicity of it. It will be perfect for a little guy to grow up in. 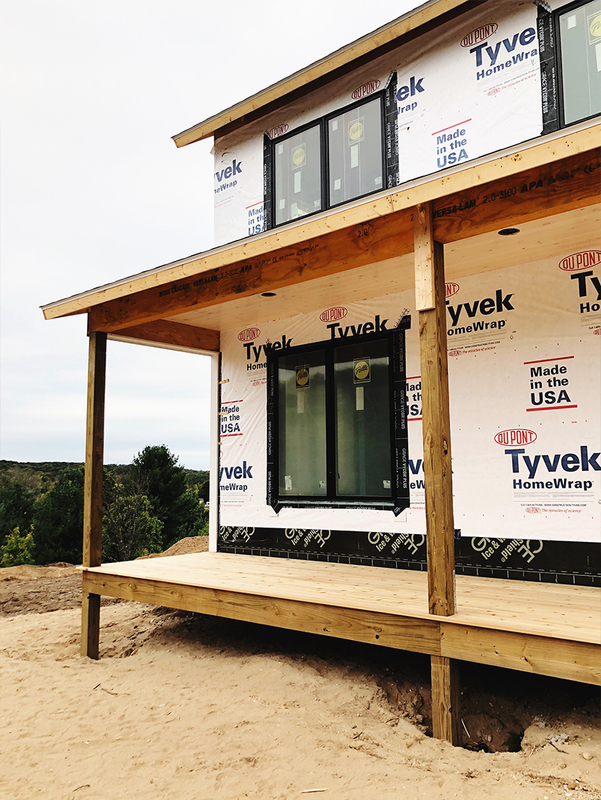 On the exterior, we are still waiting on two windows to come in. 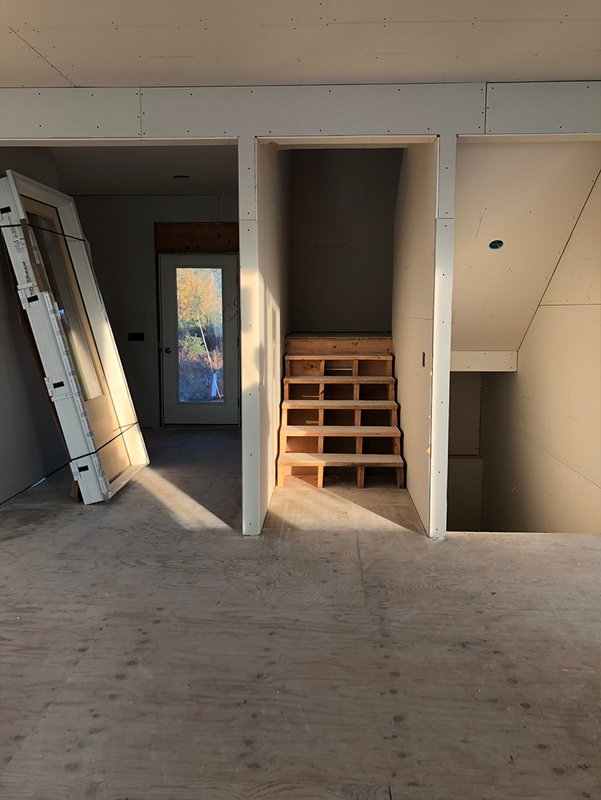 There is still quite a bit of grading to take place, and a lot of siding and exterior finish work to finish which they are focusing on the next few weeks while drywall and finish work inside is beginning. Currently, though we have our PVC horizontal white siding going on. 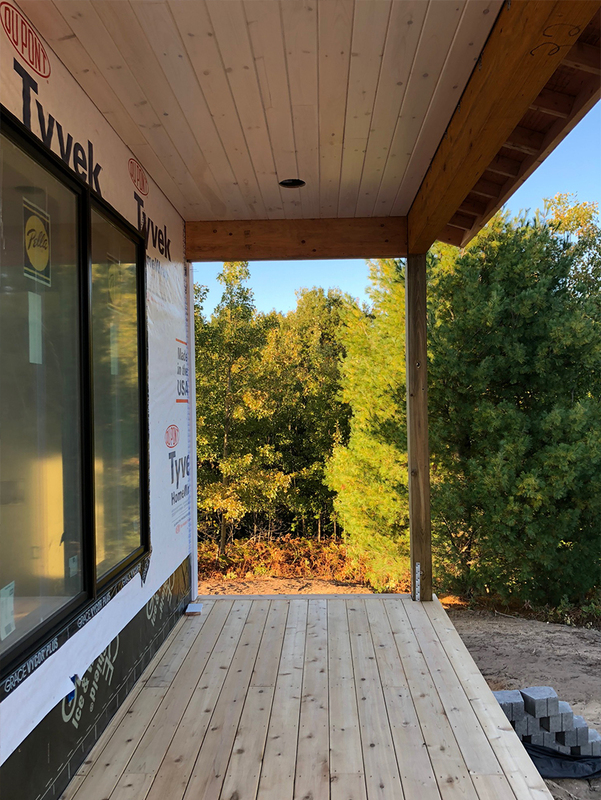 We have our cedar trim primed and framing some of the windows We also have our cedar deck in and whitewashed pine ceilings in. We also have retaining walls done. You can see more about exterior decisions in this post. 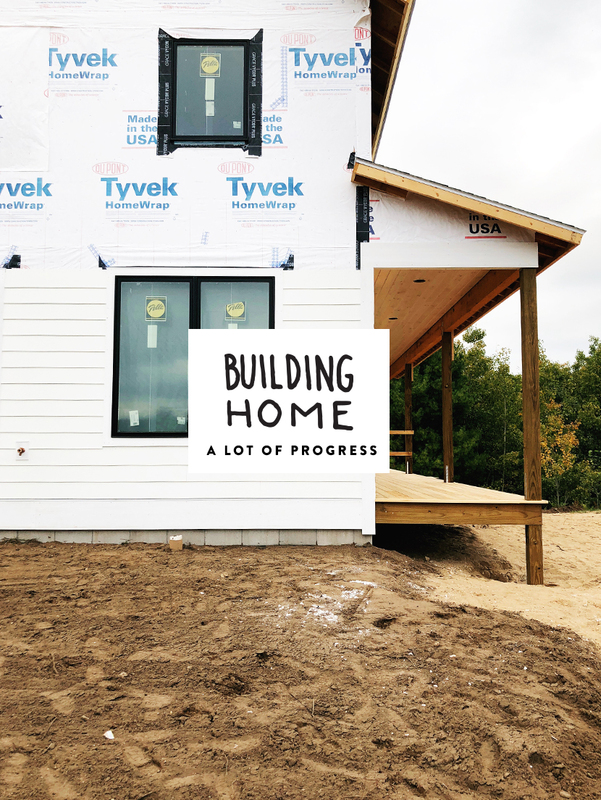 Our front door should go in before the end of the month and I cannot wait to see it! I am really excited for the size and presence of it on the house. I think it will really feel perfect for the house. Watch Instagram to see when that guy goes in! 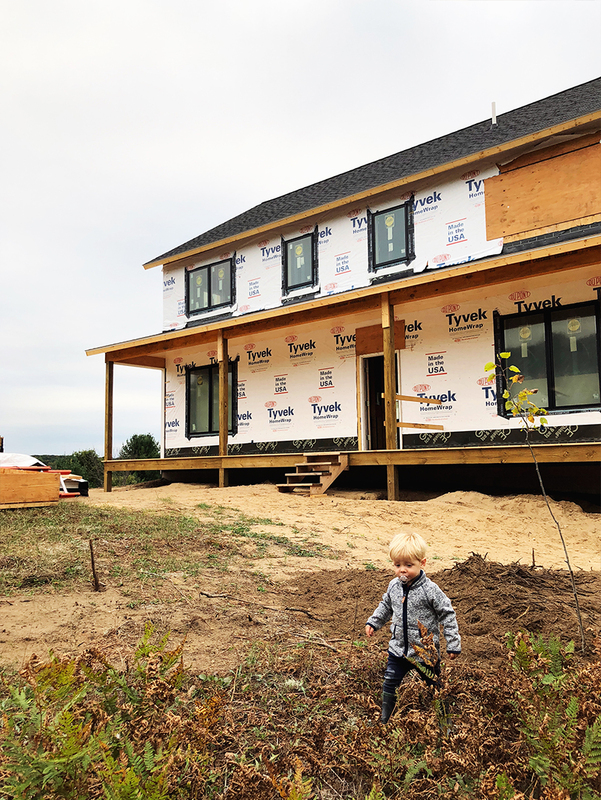 Finally, the backside of the house is all graded now and we plan to eventually place a large deck out front of the house down the road. We think it will be a wonderful place to enjoy fall and spring since it would get full sun all day. I cannot believe how it is all coming together. Every day I get a little giddy about it all. Currently, we are thinking we will be in sometime between the end of December and January. Crossing our fingers for Christmasish since we are off and moving would be easiest then, but not getting our hearts set on anything. We aren’t in a real hurry, just excited. Loved this update…What a beautiful place to live.